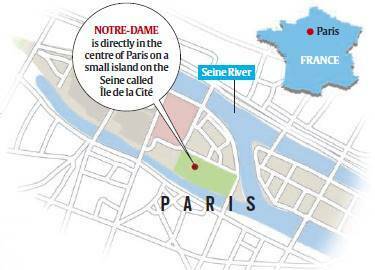 Notre Dame is a religious landmark, and a national, cultural, historical emblem of France. The fire in the holiest week of Christianity has done ‘colossal damage’. How did it happen, and what happens now? 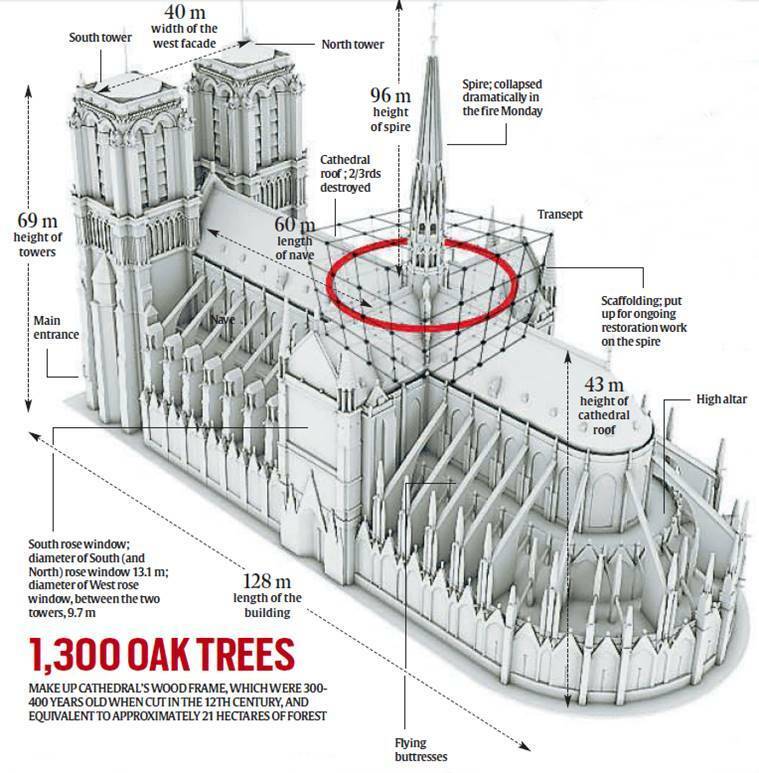 WHEN AND HOW: Notre Dame was declared structurally sound after a preliminary inspection Tuesday, but the wood-and-lead roof and lacy spire, built of 750 tonnes of oak lined with lead, is gone. There are three huge holes in the vaulted ceiling, and a part of the vault has collapsed. The surface of the stone could have suffered due to being doused with cold water while very hot. A detailed assessment will take numerous tests, likely over many months. COST OF RESTORATION: It is expected to be in the range of at least hundreds of millions of euros. The LVMH Group — which owns Louis Vuitton, Christian Dior and Givenchy — and its CEO Bernard Arnault, the third richest person in the world, pledged €200 million. François-Henri Pinault, CEO of the Kering Group which owns Gucci and Yves Saint Laurent, and oil and gas giant Total promised €100 million each. President Macron has said France will launch a global fundraising campaign, and European Council president Donald Tusk has appealed to EU member states to contribute. EARLIER RENOVATIONS: This is probably the worst damage the cathedral has ever suffered. The present edifice was built after the original was destroyed by fire, and another fire led to more work between 1230 and 1240. Louis XIV and Louis XV remodelled it in the 17th and 18th centuries. In 1786, the original spire was replaced. The cathedral was damaged during the French Revolution, and there were overhauls from 1844 to 1864, when the spire and flying buttresses were re-done. In 2017, a €160 million renovation began, which was ongoing. WHAT’S LOST: Enough detailed information is available for France’s highly developed restoration industry to produce a technically precise reconstruction. But it will never be the same cathedral again. Most of the chestnut and oak beams in the roof were originals from 800-900 years ago, from trees cut around 1160, when they were perhaps 300-400 years old. Such massive trees, and so much wood, is simply not available any longer. Also, the stone will be cut by machines rather than by hand. Around 6.30 pm Paris time, smoke was seen on the roof near the scaffolding, and a fire was discovered in the attic — an oddly-located, rarely-visited space under the roof, nicknamed the ‘forest’ because of the dense network of massive wooden beams that crisscross it and are key to the building’s structural integrity. In less than an hour, the fire had spread outward from the area around the scaffolding (red ring) and climbed up the spire, a giant wood-frame needle covered in lead, about as tall as a 30-storey building. 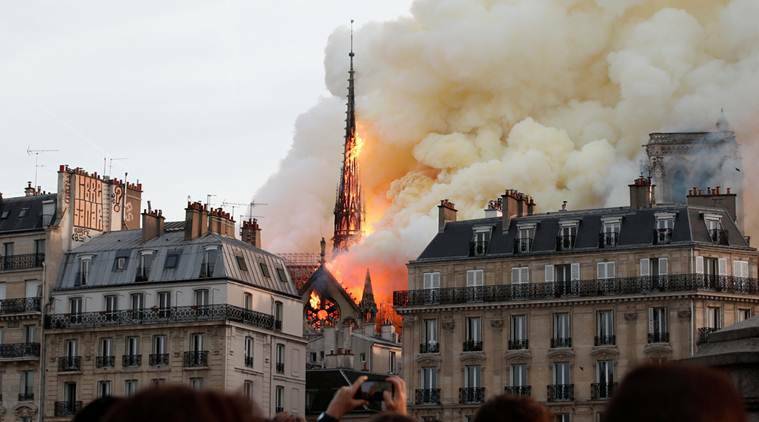 The spire collapsed and the fire kept spreading, burning through about two-thirds of the wooden roof before it could be put out around 11 pm. The two magnificent towers were saved. The cathedral whose construction began in 1160 and which was consecrated nearly two centuries later in 1345, is arguably the greatest symbol of Paris, visited by 13 million people annually — nearly double the 7 million who visit Eiffel Tower. The beloved landmark has been an inalienable part of the cultural history of France, inspiring the paintings of Marc Chagall, and immortalised in Victor Hugo’s The Hunchback of Notre Dame. It is the seat of the Archbishop of Paris; where England’s Henry VI became, in 1431, the King of France; where Napoleon was crowned Emperor in 1804; where Joan of Arc was beatified in 1909. The great masterpiece of French Gothic architecture has survived, albeit not unscarred, the French Revolution, the Paris Commune of 1871, the two World Wars. 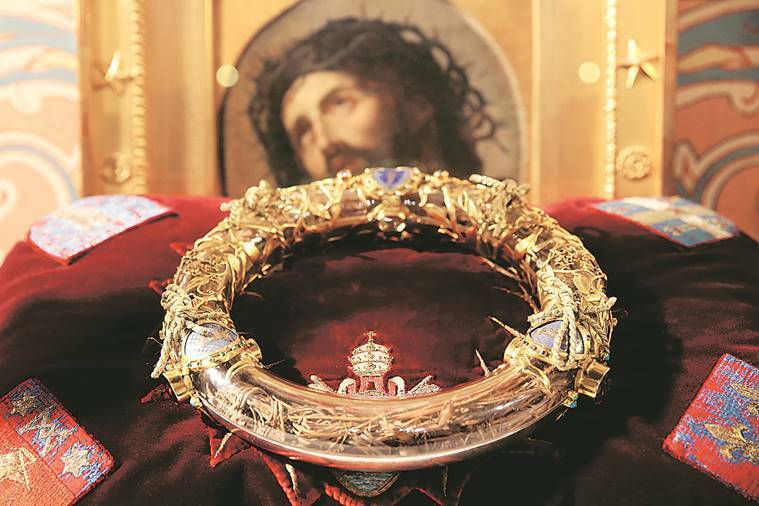 SURVIVED: Notre Dame’s most treasured relic, a band of rushes supposedly from the original crown of thorns placed on Jesus’s head during his crucifixion (above); the 13th century Tunic of Saint Louis; at least one of the cathedral’s immense stained glass windows. FATE UNKNOWN: Numerous other works of art and statues, including the 8,000-pipe great organ, Nicolas Coustou’s Descent From the Cross sculpture, and the purported fragment of the cross and a nail used in the crucifixion of Jesus.